The Extras Arent Extra at Drury Hotels. Your great rate includes FREE Hot Food and Cold Beverages at our 5.30 Kickback/ FREE Hot Breakfast/ FREE Wireless Internet Access and FREE Long Distance. Our 5.30 Kickback includes a rotating menu of chicken tenders/ meatballs/ baked potatoes/ soup/ salad/ beer/ wine/ soda/ mixed drinks and more -subject to state and local laws-. Dont miss our great Free Hot Breakfast Buffet with / sausage/ Belgian waffles/ biscuits and gravy/ fresh fruit/ bagels/ and pastries. Take advantage of FREE popcorn and soda every evening from 3-10 p.m. as well as our complimentary exercise room/ and 24 hour business center. Located at business 60 and US 67 North Poplar Bluff Municipal airport is 7 miles east and Las Margaritas restaurant is adjacent to the hotel. For eleven consecutive years J.D. 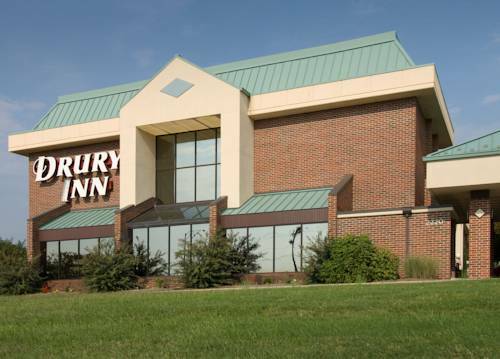 Power has recognized Drury Hotels with the award for Highest in Guest Satisfaction Among Mid-Scale Hotel Chains. Come stay with family at Drury Hotels. Miscellaneous Information - free quikstart breakfast served daily / free local phone calls one hour of domestic u.s. long distance calls per night / free evening beverages and snacks served daily 5.30 -7 p.m / cable tv / 100pct satisfaction guarantee / in-room coffee service / exercise room / outdoor pool Awards 2 Diamond AAA Rated. Our Free Hot breakfast buffet includes / sausage/ biscuits and gravy/ waffles and more. Our 5.30 Kickback includes a rotating menu of chicken tenders/ meatballs/ hot dogs/ wings/ beer/ wine/ soda/ and more -subject to state and local laws-. ~50 miles from Poplar Bluff. ~56 miles from Poplar Bluff.